Parents of school-age children can often become bewildered by today’s education system and it’s expectations. Its quickly evolving nature makes it hard to keep up with the latest teaching methods, the many types of tests our children are receiving, and the technology they are using in the classroom. 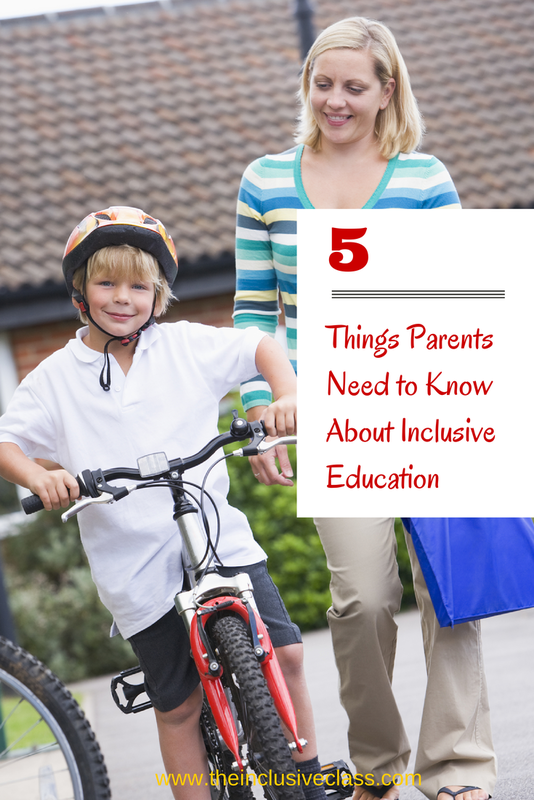 Parents of school age children with special needs however, have even more information to sift through – they need to also understand Individual Education Plans, special education acronyms, and different types of services that are available in special education. In short, the education system can completely overwhelm even the most knowledgeable people! Inclusive education is one such term that is often used in special education as it is considered by special education experts to be the ideal situation for educating children with special needs. Sadly, however, the concept of inclusive education is often misunderstood. 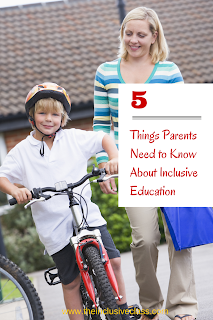 If you are a parent of a special needs child who is in an inclusive classroom or being considered for inclusive placement, this article will give you a brief overview of inclusive education and 5 things you need to know. ALWAYS TOGETHER - A truly inclusive environment is one in which a special needs child is a fully active member of a general education classroom – not just for PE, Art or Music – but for all subjects. An inclusive school provides equal access to school routines and programs. Lunch and recess are together, students participate in assemblies and extracurricular activities are timed to include as many children and families as possible. Inclusion is a way of interacting with one another, not a place to go to for an hour every day. ALWAYS PARTICIPATING - Inclusion promotes social interactions between students, teachers, parents and school. Relationships develop and are strengthened in an inclusive environment. to the child in the classroom through paraprofessionals and resource staff. Parents are also included in this process! Inclusive classroom teachers have a significant understanding of the various needs that students have and use resources, support staff and assistive technology to meet those needs. ALWAYS LEARNING- Inclusion provides opportunity and equal access to schooling regardless of child’s ability level. Inclusive practice benefits ALL learners in the classroom. It involves accommodating and modifying the curriculum to reach all learners. Students become more engaged, feel more successful and develop confidence in their ability to learn. Inclusion promotes a greater understanding of diversity and the world in which we live. ALWAYS WELCOME – children with special needs are welcomed in the inclusive school, regardless of ability, age and needs! As a parent of four children and an advocate for those with special needs, I support your statements, but also feel compelled to note that "appropriate" "individualized" and "educational benefit" must come into play when discussing inclusion. If the program is not individualized or appropriate, then there is no educational benefit. After many years of experience with inclusive programs, what’s clear is that finding the right balance is the true gift that inclusion can offer. Keep your eye on the ball: what’s appropriate for your child is the only thing that matters. I completely agree that inclusive programs must provide appropriate and individualized learning experiences for children with special needs, which is why an inclusive program must make room for accommodations and modifications within the curriculum. If a child is expected to "keep up with the class" it becomes more of a "mainstream" situation which does not allow for children of ALL abilities to be in that classroom. Thank you for highlighting that important piece of an inclusive classroom! I used to think that the only type of educational setting in which my son would flourish was that of a specialized school for children with autism. Unfortunately, many children begin to develop a limited view of what their world can be by being excluded from the general population. Thank you for this informative post, it shows that inclusion, when done well, is not only possible, but should be expected. I appreciate your feedback and glad you found the article helpful! I also like the fact that you used the phrase, "inclusion, when done well, is not only possible, but should be expected." So true!! This article is right-on, except for the lack of Person First Language. Using language that indicates the person before the special needs is another way we can further the attitude of those not quite sold yet on full inclusion not to mention it is the right way to refer to people with special needs. Thanks for all of the great work you do to continue promoting an inclusive education for all. Person first language depends on the person and the disability. Some groups feel that the disability is very much apart of them and choose to ID themselves as such. An example would be Deaf vs. deaf or even Autistic vs person with autism. We need to make sure we are discussing labels and disability language with those who have the disability. Leave them out can be a form of ableism in it's self.